Landslide toe and damage to the house at 739 Parkway Drive. Photograph taken August 5, 2014, view toward southwest. Landslides are common natural hazards in Utah. They often strike without warning and can be destructive and costly. Common types of landslides in Utah are debris flows, slides, and rockfalls. Many landslides are associated with rising ground-water levels due to rainfall, snowmelt, and landscape irrigation. 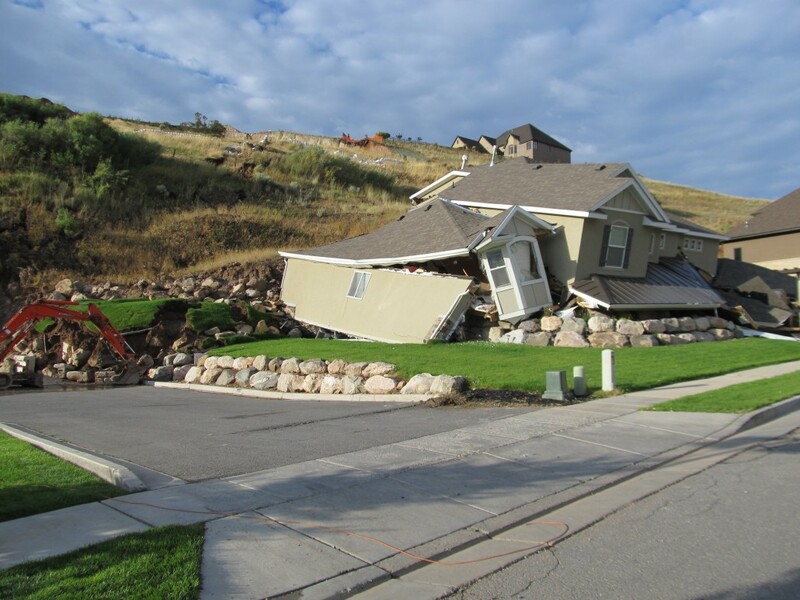 Therefore, landslides in Utah typically move during the months of March, April, and May, although debris flows associated with intense thunderstorm rainfall are common in July. Glad You Asked: Can Rockfalls Cause Wildfires? from Survey Notes, January 2007. Includes South Weber; Sunset Drive and Beechwood Drive, Layton; Creekside Drive, Mountain Green; Sherwood Hills, Provo; and, City Creek Canyon, Salt Lake City. from Survey Notes. Includes South Weber; Sunset Drive and Beechwood Drive, Layton; Creekside Drive, Mountain Green; Sherwood Hills, Provo; and, City Creek Canyon, Salt Lake City.